My final of three organized tours ended last night, so now seems like a good time to reflect on it. I’m a pretty independent traveler who tends to shun groups — with that said, when visiting countries like Egypt (where transportation logistics are complicated) or China (where no one speaks English), there isn’t much choice in the matter. There weren’t similar challenges on this leg of the trip, and if doing it over, I’d probably have done it alone. While my tour guides in Egypt and China provided valuable and historical insight, my tour leader for the “Roam Malaysia” trip simply arranged accommodation and transfers, something I’d have felt more than capable of handling on my own. And doing so would have given me more freedom — so, no 1-star hotels or 24-hours of continuous travel. With that said, the fellow travelers I’ve met have been really solid and made the experience pretty enjoyable. A few of us had breakfast at the hotel before heading our separate ways. 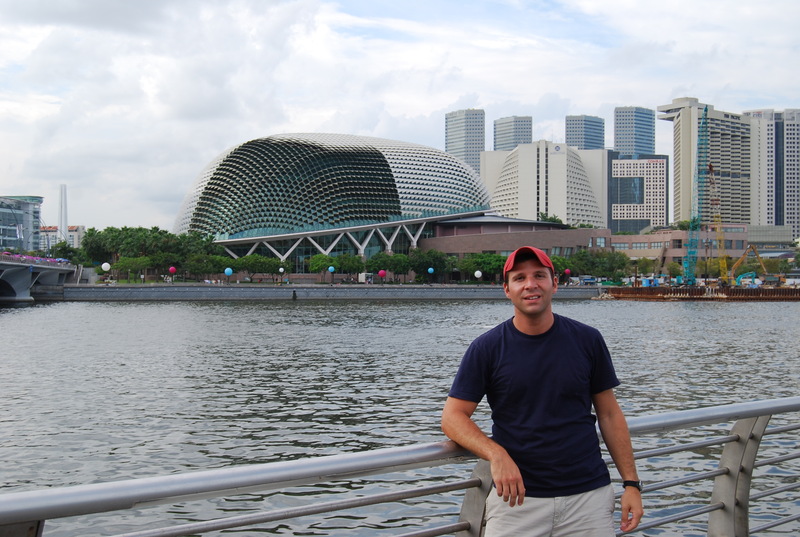 This was my second, and final, day in Singapore, so there were a couple of other sights to check off my list. 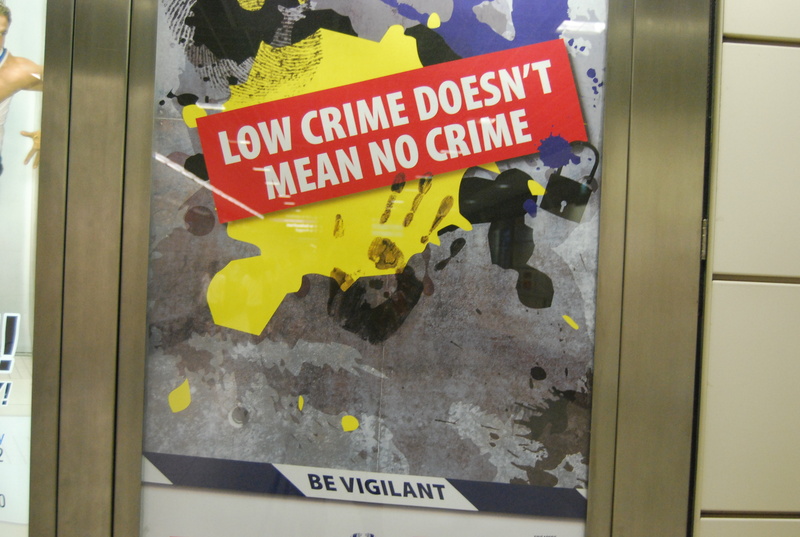 On the way down to the MRT, a sign caught my attention and got me thinking about this country. While there does to be a minor sense of paranoia instilled here, in my experience, this is not the “sterile utopia” some have spoken of. 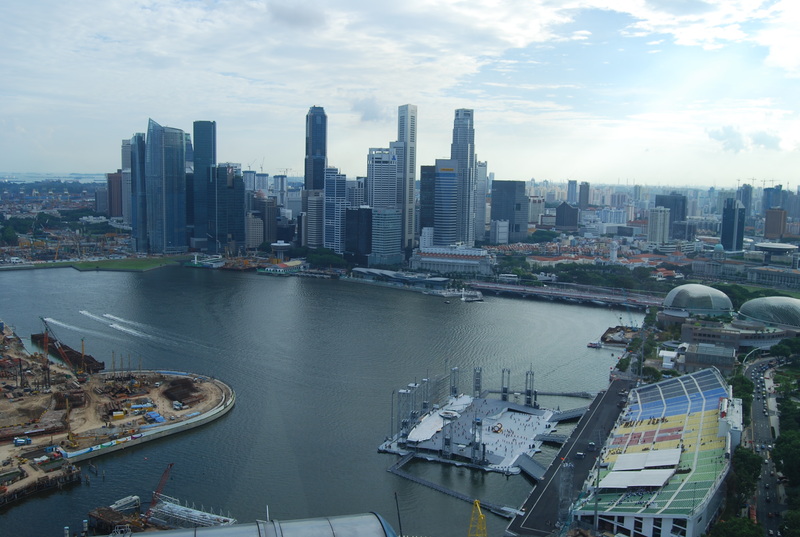 I’ve actually found Singapore to be a nice break from the rest of Asia — English seems like the first-language, the streets are immaculate and, with so little crime, you can let your guard down a little bit (while, of course, staying vigilant). 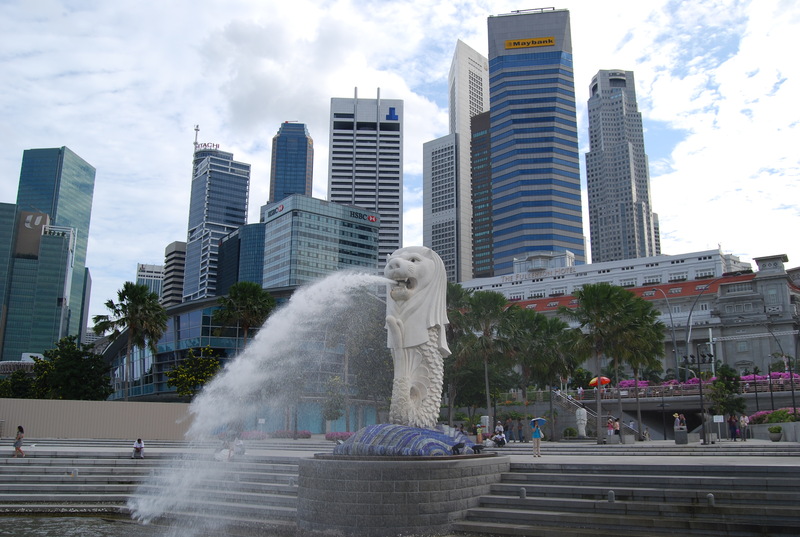 The Asian Civilizations Museum is located in a beautiful building along the Singapore River. It had some very impressive galleries on the development of trade, religion and technology in Southeast Asia. A special exhibit on Vietnam got me pumped for my upcoming visit there while interactive displays kept me interested for a couple of hours. After succumbing to a couple of purchases in the museum store, it was off to Sentosa Island, Singapore’s “resort playground.” With imported sand and fake boulders, it’s a little Disney-esque, but is said to have the country’s finest beaches. 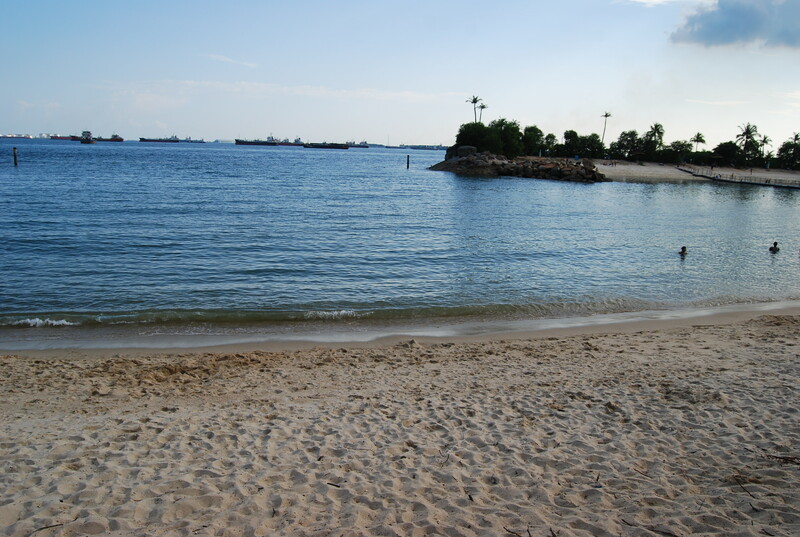 The Sentosa Express brought me right to Siloso Beach, from which the thumping music of Café del Mar could be heard. 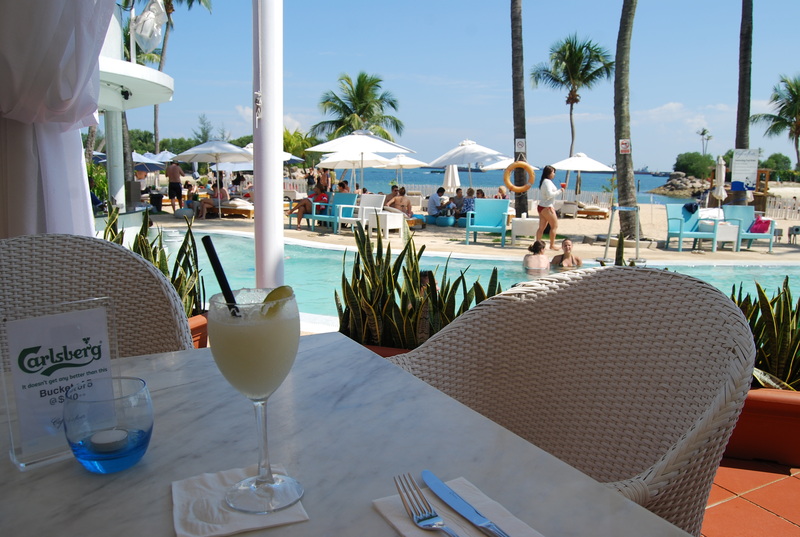 This is a place trying desperately to be in South Beach, and while it fails miserably, it did serve up a mean frozen margarita as well as a salt water pool — a far better option for cooling off than the murky, and container ship-filled, Straits of Singapore. Two other travelers from my G.A.P trip were still around, so we got dinner at Lau Pa Sat, a food hawker market that dates back 150 years. 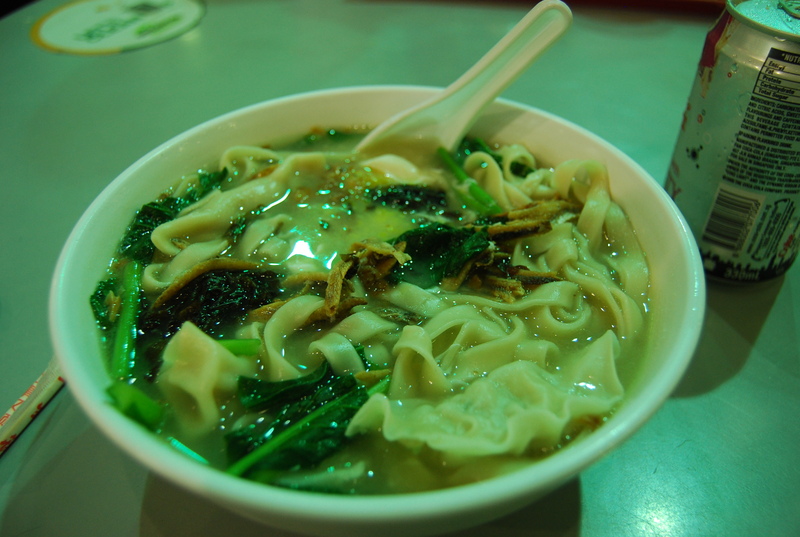 Some soup lady called me over and concocted a dumpling, noodle, bok choy and anchovy bowl of deliciousness. Afterwards, we took MRT and then a taxi (whose driver was falling asleep) to the Night Safari, purportedly the world’s first and only park of its kind. There are over 1,000 nocturnal animals there illuminated in a shadowy half-light — making humans largely oblivious to them. Highlights from a tram ride included an elephant with a huge tusk, lions sleeping on their backs, baby otters playing and a pair of very impressive leopards. 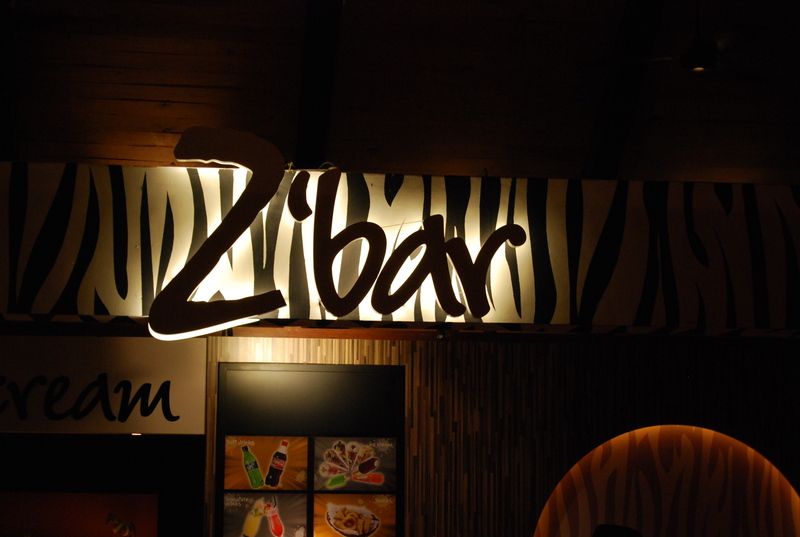 Unfortunately, no pictures were possible, except of this bar named after me. We headed back to the hotel, packed and then took a dose of Malarone, all in anticipation of tomorrow’s flight to Cambodia. With a 5-hour bus here this morning, we completed our 12-day, 1,943 kilometer trek from Bangkok, through Malaysia, to Singapore. All told, we spent nearly 48 hours on a half dozen buses and an overnight train. It wasn’t the easiest leg of my 80-day trip, especially with two difficult overland border crossings, including the one this afternoon that took about 90 minutes. We were pretty excited then after crossing the Straits of Johor and arriving in this city, island and country of 4.3 million people. We were even more floored when we set foot in the Fragrance Imperial Hotel — a trendy spot with the first flat-screen televisions I’ve seen in weeks — and then learned that due to a booking error, we would all be given single rooms. No complaints here (for once). With its very strict social and political agenda — death penalty for drug traffickers, harsh penalties for gum chewing, littering, jaywalking and just about everything else — Singapore has been called a “sterile utopia.” After dropping our bags off, we obeyed the walk signals and set out to see exactly what this (perhaps, misunderstood) country is all about. Our mode of transportation was Singapore’s MRT, a clean, modern, efficient and cheap subway. The escalator down to the platform from the street moved at least twice as fast as those in the States — hang on! 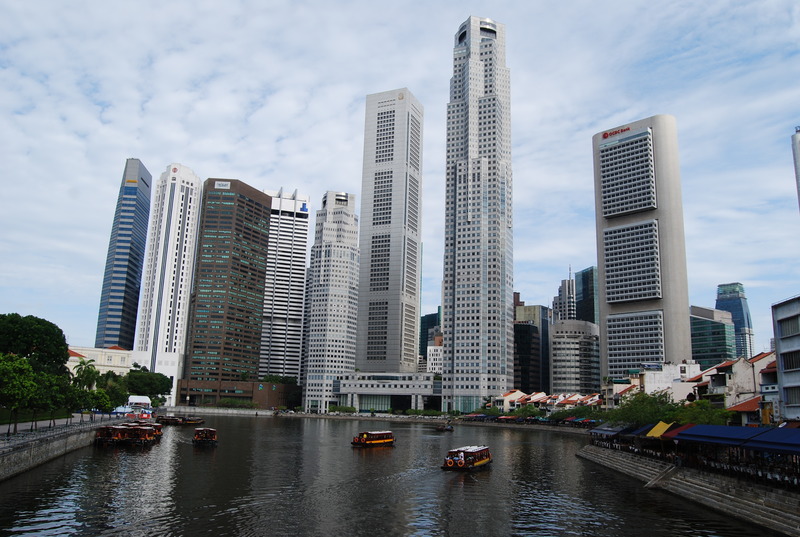 We made it easily to the Raffles Place stop and walked to the Boat Quay, one of the few historic downtown districts that have been spared the wrecking ball in favor of economic development. 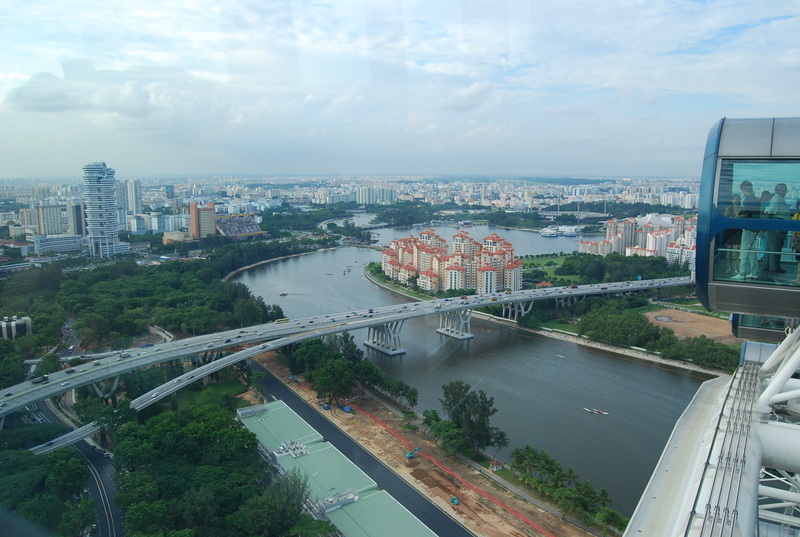 There, small restaurants and bars line the Singapore River, and we ducked into a pub for a quick sandwich. Walking along the esplanade, we spotted the gleaming Theater on the Bay, a spiky structure that stands across from the Merlion, this country’s strange half-fish, half-lion mascot. 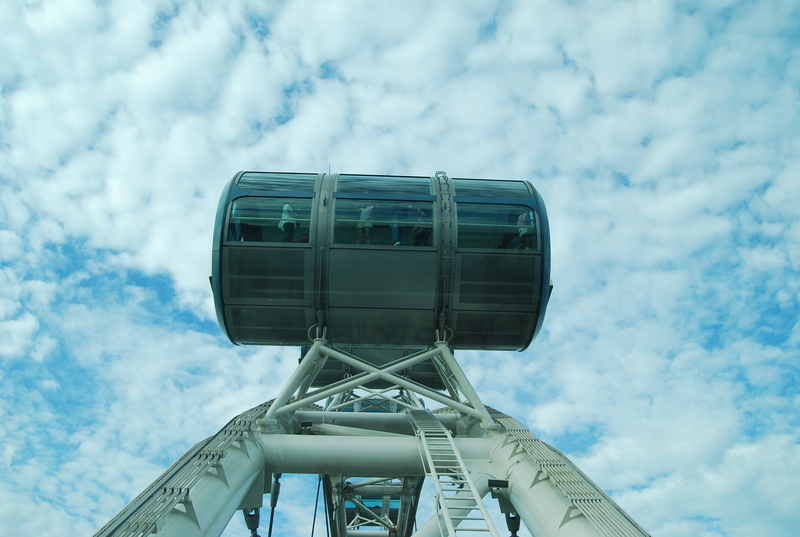 From there, it was easy to see the Singapore Flyer, the world’s largest observation wheel — standing at 165 meters, it’s even taller than the London Eye. I’ve learned that one of the best ways of really seeing a city is to get to its highest point, so we swallowed the ticket price $S30 ($21USD) and hopped into a cabin. The 30-minute ride did not disappoint, as we could even see as far as neighboring Indonesia and Malaysia. Drenched from the humidity, we made an obligatory stop at the landmark Raffles — my second visit, after Dubai, to this hotel chain. 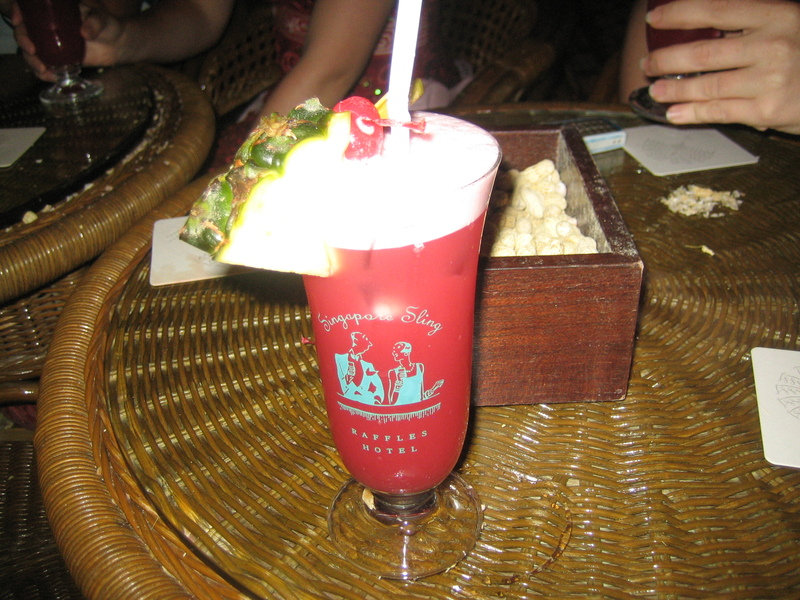 We had a signature Singapore Sling, a drink that was invented here and is today dispensed from a tap, in the peanut shell-covered Long Bar. Afterwards, it was off to CHIJMES, a nearby complex of restaurants and bars for a farewell dinner.